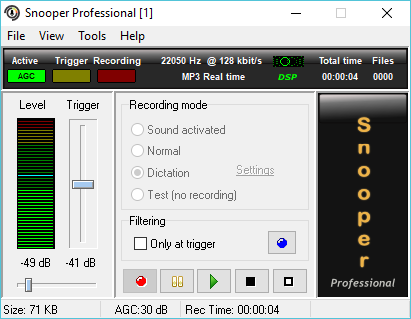 Snooper is a professional sound/voice activated recorder application for Windows with advanced trigger, flexible filter settings and a built in spectrum analyzer. The user interface is well organized and is suitable for all types of users, from beginners to highly experienced people. Snooper Professional voice activated recorder software GUI. Use stealth mode or run Snooper as a Windows service to hide Snooper from the taskbar and tray area. Option to automatically start or stop a recording when switching to or from screen lock. Snooper can be scheduled to start and stop a recording at any time you set. It can also record on the fly for as long as you like without interruption. Post process your recordings with automatic Zip-compression, PGP encryption, email sending, upload to Dropbox or an FTP-server, execute external programs or execute your own plugin. Suppress unwanted signals according to a pre-recorded noise profile. This in combination with the automatic gain control (AGC) can capture sounds with very low amplitude. Advanced users can use the frequency analyzer to help fine tune the setup with different filters to enable the recorder to be highly sensitive. To make sure that the recordings are reliable, consistence and accurate over its entire life-cycle enable the Data Integrity plugin to guard your recordings. Use the built in sound pressure level (SPL) meter to document noise levels for over a longer period of time. This is often used for documenting dog barks or loud environmental noise over a day. The multi channel version of Snooper records multiple audio channels simultaneously. Read more about Multi channel recording!